I am really excited to have Sage Adderley, founder of Sweet Candy Distro & Press, creator of Sage's Blog Tours, and author of Invoking Nonna. I had the pleasure of working with Sage on my own virtual blog tour for Fire of the Sea (she offers amazing blog tour packages for authors, and throws in some mini promo buttons, to boot). And Sage's debut novel, Invoking Nonna was so captivating that I carried it with me everywhere I went to sneak in a read whenever I could, finishing it in three days flat (that's saying something for an overextended author-mom, let me tell you)! I thought I'd start of with my 5 star review of Invoking Nonna, followed by a great Q&A with Sage. Be sure to click the links at the end of this post to check out everything Sage has to offer! 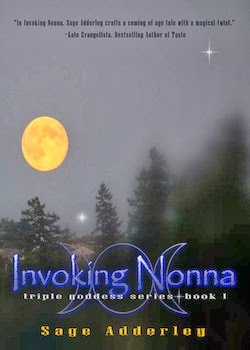 Invoking Nonna was a magical read, with a wonderful woven tapestry of female relationships. Maggie, a teenage witch just coming into her own, was believable and relatable. I was initially drawn in by the fact that this book took place in the 1990's, when I was also a teenager. So I could immediately connect with Maggie's world, and it was fun to relive the high school scene from a distance. I enjoyed the authentic wiccan details, and sense that magic can be something real, attainable--not just a craft to be feared. Other details that made this book stand out for me: The book size is charming, and gives a nod to zines, which Sage Adderley is also known for publishing through Sweet Candy Distro. Also, Sage has a great grasp of the senses. I loved her food and color descriptions, especially. This was an intriguing first novel in the Triple Goddess Series, and left me eager to read more! What inspired you to write Invoking Nonna? I love writing and I am drawn to the idea of exploring coming of age stories. It’s such an important time in everyone’s life. I don’t think young adult readers are the only ones who relate to them, adults do, too. We’ve been there in some way. I wanted to write about family drama, but not in a Jerry Springer type of way. I have a difficult relationship with my parents and I’ve shamelessly channeled a bit of it in my fictional character, Maggie’s life. As a busy mom, when do you find time to write? It’s been a long summer of not writing, but now that my kids are back in school I can definitely schedule in some morning writing. I am completely overjoyed about this. The keyword is ‘schedule.’ I actually have to pencil in time in my day to focus solely on my writing. I am okay with that. You have to do whatever it takes. I feel more creative in the morning. I need a relatively quiet area, soft music or the sound of the television in the background is okay. After the kids get on the bus is actually prime time. Coffee is a must! I am definitely not the type of writer who can sit in a public place to write. I am far too distracted with the people moving about. Tell me about the recent creative retreat you attended, and why you feel it’s so important as women/writers/artists to take time for events like this. Women are warriors. We carry the weight of our work, our households, and our family on us at all times. In the end, it’s so common to neglect basic self-care needs for ourselves, which is unfortunate because if we aren’t taking care of ourselves, we will not function at our strongest level. The creative retreat I attended was amazing. It was an educational and therapeutic experience. I was able to take a weekend off from my daily life to rest, make art, learn new tips on running a creative business, and best of all, network with a wonderful group of women. I highly recommend doing something like this. It was refreshing and really boosted my creative spirit. Tell me a little about Sweet Candy Distro, and for those who don’t know what IS a zine? A zine is self-published work, normally photocopied and bound in different sizes –similar to a chapbook or hand drawn comic. The writing is commonly found to be in a diary style. The subject matter ranges from silly to serious topics. Sweet Candy Distro is an online store that distributes zines. I’ve been running it for a little over ten years now. I carry zines for all ages. I think it’s important to teach people a way to share their voice in a creative way. What are you currently reading personally and/or with your kids? My son is 5-years-old and we’re currently reading a book called Seedlings, Fables from the Forest by C.D. Baker. The fables focus on kindness, sharing, forgiveness, etc. It’s awesome. There are questions to ask your child at the end of each story and even places to draw pictures. In my spare time (insert light laughter) I am reading Synchronicity by Michael Bradley. He is a great suspense writer. I make zines, hang out with my family, love on my cats, and make small pieces of mixed media art. I also find cooking in the kitchen to be a lovely outlet. Don’t stop writing . Don’t listen to naysayers or your inner critic. The more you write and learn to edit your work, the better you will get and the closer you will come to really portraying your writer’s voice. Join writing classes, book clubs, surround yourself with writers. Don’t be afraid to share yourself or your work.